Swollen eyelids are a fairly common eye condition caused by inflammation or excess fluid in the connective tissues surrounding the eye. Depending on the cause, swollen eyelids can be painful or not painful and affect the upper eyelid, the lower eyelid, or both. Swollen eyes can be caused by many different factors, including allergies, styes, a blocked gland, traumatic eye injury, and conjunctivitis (“pink eye”). In some cases, swollen eyelids may be symptomatic of a bigger health problem, such as orbital cellulitis (a sudden infection of the tissue surrounding the eye), Graves' disease (an autoimmune eye disorder associated with abnormalities of the thyroid gland), and ocular herpes (a recurrent viral infection that can cause inflammation and scaring of the cornea). In general, swollen eyelids are accompanied by symptoms such as itching or scratching sensations, excessive tear production resulting in watery eyes, obstructed vision, redness of the eyelid, eye discharge, and eyelid dryness or flaking. Pain generally accompanies swollen eyelids that are caused by an infection. Many people also use the term “puffy eyes” interchangeably with swollen eyelids. However, for medical professionals, swollen eyes are generally used to describe an immune system response to an allergy, infection, or injury. Puffy eyes typically refer to eyes that are swollen from external reasons, such as water retention, a lack of sleep, or even genetic traits like dark circles under the eyes. Eye allergies are the most common cause for swollen eyes. 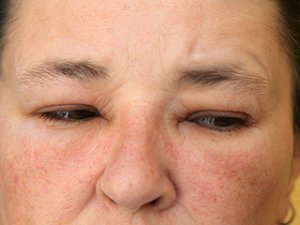 In this case, the swollen eyes are symptomatic of the body’s overreaction to a foreign substance, known as an allergen. Common allergens that can trigger swollen eyes include pollen, dust and pet dander. Some types of contact solution and eye drops may also trigger an allergic reaction in certain individuals. The treatment of swollen eyes depends on the cause. Generally, if eyes are swollen due to allergies, antihistamine drops or oral allergy medication will be an effective treatment. For severe allergic reactions, an eye care professional may also recommend mild steroid drops. Ocular herpes and conjunctivitis are treated with anti-viral medications or anti-inflammatory eye drops, ointments, or antibiotics. For at home care, remove contact lenses (if you wear them) until the swelling stops. Applying a cool compress can relieve swelling and pain. Most importantly, do not rub the eyes as this will only aggravate the condition. Contact an eye care professional should conditions worsen or pain intensify, in order to rule out the possibility of a more serious cause for this pain.